The Author caught Dengue Fever AGAIN, this time at Chicago's Empty Bottle (the same place they rocked in '08). Once again, the place was packed, the band crisp and the crowd appreciative. Chhom Nimol was at her best, bending impossible notes, chatting up the audience and joshing with Zak. A strenuous 2-hour set, with a rousing encore of I'm Sixteen. (From December 2009) The Author caught Dengue Fever at Chicago's Old Town School of Folk Music recently. As always, they were stunning! A much larger yet more subdued audience than when Dengue played the dark and rowdy Empty Bottle in '08, but the band rose to the challenge. Lead singer Chhom Nimol was luminous, charismatic, flirty, her voice soaring clear and true. The band played all the faves - New Year's Eve, Sni Bong, Sober Driver, Shave Your Beard, Hold My Hips, Mr. Orange - and a version of Tiger Phone Card that brought a lump to The Author's throat. The band was crisp, fun, funny. They ended with I'm Sixteen, a cover of a song done by legendary Cambodian singer Ros Serey Sothea (who perished in the Killing Fields). 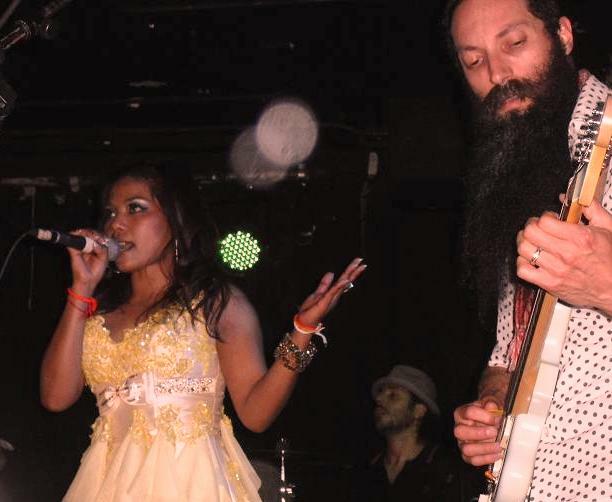 For the uninitiated, Dengue Fever combines California surf rhythms and a '60s garage sound with traditional Cambodian melodies. Mix in a wailing sax, Farfisa keyboards and an unrelenting bass, and you have a band with global appeal. Founders Brothers Holtzman recruited Nimol, a native Cambodian who was singing at weddings and bars in California's Cambodian immigrant community. They have since traveled throughout Cambodia in search of the perfect song and performed before audiences worldwide. After their recent Chicago show, The Author chatted with Zak Holtzman and Chhom Nimol about garage music and his own Cambodian Adventure. 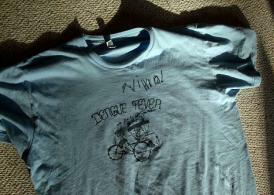 They signed The Author's Dengue Fever T-shirt.